Members of the Egyption Christian community meet Father Issac Anba Bishoy for condolences at St Antony Cathedral For Coptic Orthodox in Abu Dhabi. 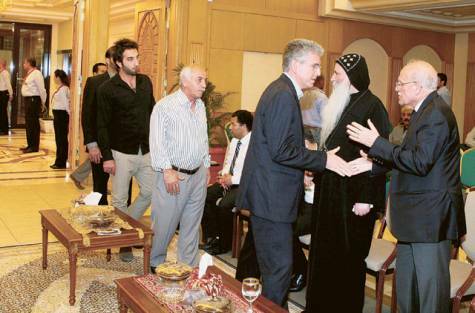 Abu Dhabi: Members of the Coptic Christian community in the capital have experienced a myriad of emotions since the official news of their patriarch's death Saturday night. Having led his faithful community for more than 40 years, Pope Shenouda passed away at the age of 88 after battling liver and lung problems for several years, according to official reports in Egypt. 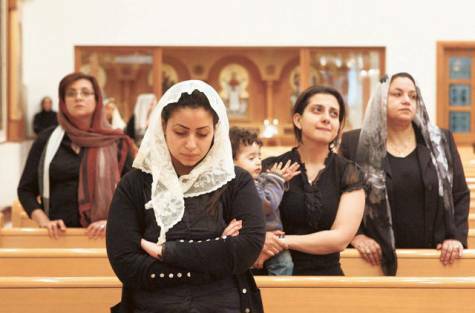 "The news is very saddening for all Coptic Christians. Pope Shenouda III was a great leader of our church, always seeking to foster peace and understanding wherever he went," said Father Issac Al Anba Bishoy, Pastor at the Cathedral of Saint Antony for Coptic Orthodox in Abu Dhabi. "He always stressed that there were three ways people could attain peace in all aspects of their lives: peace with God, peace with others and peace with one's enemies," he added. The cathedral held a memorial service yesterday and a condolence gathering in the evening. A formal set of memorial services and condolence meetings is scheduled for this week after the pastor and members of the church council return from the pope's funeral tomorrow. "It was such a shock when his death was announced… in addition to our memorial service, we also received condolences from our community, the Egyptian embassy and representatives of other embassies and governmental officials," Ashaia Haroun, 66, a business consultant and church council member. "We will hold formal memorial services and receive condolences on Wednesday afternoon and the whole of Thursday and Friday for those who wish to pay their respects," he added. According to Father Al Anba Bishoy, Pope Shenouda succeeded his mentor, Pope Kirlos to become the 117th Pope who was chosen to lead the minority Christian community on February 14, 1971. Prior to being chosen, the pope, whose birth name was Nazeer Gayed, received a Bachelors of Art degree in English, was a writer and poet, and a reserve officer in the army before joining a monastery in his late 20s. "Pope Shenouda was not only a learned and cultured leader, but he also loved his country very much and always strove to find a balance for all to live harmoniously with each other," the pastor said. "But he was also known for his firm stance on many issues, some of which didn't endear him to our presidents, such as Anwar Sadat, who was upset when the pope said that he wouldn't allow any Coptic Christians to visit [occupied] Jerusalem until it became free because Sadat had requested that the pope be diplomatic towards Israel," he added. The pope visited Abu Dhabi twice, the first time in 1994 and then in 2007 to inaugurate the St Anthony Cathedral. "I was fortunate enough to be here for both his visits… they were both very special experiences… for his second visit, he gave a powerful sermon that moved us all…he will truly be missed," said Safaa Samuel, 48, an employee in the Abu Dhabi Chamber of Commerce.